Background: Roughly 30% of schizophrenia patients fail to respond to at least two antipsychotic trials. Psychosis has been traditionally considered to be poorly sensitive to psychotherapy. Nevertheless, there is increasing evidence that psychological interventions could be considered in treatment-resistant psychosis (TRP). Despite the relevance of the issue and the emerging neurobiological underpinnings, no systematic reviews have been published. Here, we show a systematic review of psychotherapy interventions in TRP patients of the last 25 years. Methods: The MEDLINE/PubMed, ISI WEB of Knowledge, and Scopus databases were inquired from January 1, 1993, to August 1, 2018, for reports documenting augmentation or substitution with psychotherapy for treatment-resistant schizophrenia (TRS) and TRP patients. Quantitative data fetched by Randomized Controlled Trials (RCTs) were pooled for explorative meta-analysis. Results: Forty-two articles have been found. Cognitive behavioral therapy (CBT) was the most frequently recommended psychotherapy intervention for TRS (studies, n = 32, 76.2%), showing efficacy for general psychopathology and positive symptoms as documented by most of the studies, but with uncertain efficacy on negative symptoms. Other interventions showed similar results. The usefulness of group therapy was supported by the obtained evidence. Few studies focused on negative symptoms. Promising results were also reported for resistant early psychosis. Limitations: Measurement and publication bias due to the intrinsic limitations of the appraised original studies. Conclusions: CBT, psychosocial intervention, supportive counseling, psychodynamic psychotherapy, and other psychological interventions can be recommended for clinical practice. More studies are needed, especially for non-CBT interventions and for all psychotherapies on negative symptoms. Schizophrenia affects approximately 1% of the population, usually starting in adolescence or young adulthood, frequently leading to persistent disability, with a high risk of suicide (8%). Despite the advance in antipsychotics treatment, approximately 30% of patients with schizophrenia show a poor response or no response to antipsychotics (1–7), demonstrating persistent positive symptoms (i.e., hallucinations, delusions). The experience of persistent delusions and hallucinations may result in further disability, poor prognosis, and risk of suicide (8, 9). Finally, treatment-resistant psychosis (TRP) is responsible for increasing health assistance expenditure. For instance, in the United States, treatment-resistant schizophrenia (TRS) adds more than 34 billion dollars in the annual direct medical costs (10). In the presence of pharmacological treatment resistance, can nonpharmacological, psychotherapy-based interventions significantly overcome the therapeutic response deadlock? Which psychotherapy in combination with antipsychotics does work better? Finally, what are the limitations and the pitfalls of the research on psychotherapy in TRS and TRP? This review aims to provide a critical, systematic overview covering the last 25 years of published results of all types of psychotherapy, as adjunctive or substitutive therapy, specifically in TRS or TRP patients, including early psychosis and psychotic onset. TRS and TRP for many patients are lifelong mental disorders with significant consequences on most functional domains (11, 12). TRS represents a severe condition with relevant clinical, social, and health costs and consequences (2). In clinical practice, the criteria to define TRS have not been always consistent over time (2). The first complete definition was introduced in the seminal article of Kane and collaborators (13) on clozapine efficacy in TRS. Most of the new proposed criteria require the lack of response to at least two consecutive treatments with antipsychotics; in most cases, one of the two antipsychotics should be an atypical one, of adequate dose and duration (≥6 weeks). An adequate dose of antipsychotic medication in the most recent report is defined as a daily dose of ≥400 mg chlorpromazine equivalence (14–17). The lack of response has been indicated as a relative change in the evaluation scales (i.e., ≥20% decrease in the Positive and Negative Syndrome Scale) (17). Psychotic symptom persistence has been demonstrated to cause distress and serious interference with functioning (18), complicating the clinical course of schizophrenia. Therefore, a large proportion of patients may never reach a functional recovery (19). These patients show poor global functioning and life quality (20, 21), increased drug abuse (6), and reduced cognitive performance compared to patients who respond to the treatment (22). Persistent psychotic symptoms have been observed for 2 years after the initiation of symptoms in 15% of cases (23). In a 15-year follow-up study of patients affected by nonaffective psychosis, every psychotic episode has resulted in raising the probability to experience residual positive symptoms. At least 25% of patients showed persistent positive and negative symptoms after the first episode, while nearly 50% presented persistent symptoms after the fourth episode (24). According to this progression of symptoms persistence, the total number of treatment-resistant patients can increase up to 60% (25). Two forms of treatment resistance have been hypothesized: a type of resistance that is already present at the onset of the pathology, and a second one that develops later on during the trajectory of the disorder and after a period of successful response to antipsychotics (26–28). Remarkably, 82% of TRS had been reported to be resistant since their first episode of psychosis, while 18% of patients with TRS develop resistance after a period of adequate response. It has been reported that the first group could recognize a neurodevelopmental disorder with relatively normal dopaminergic function and prevalent aberrant cortical–subcortical dysfunction (29, 30). Clozapine, the prototypical second-generation antipsychotic, is considered the gold standard of pharmacological treatment for TRS (31–34), even if its superiority in comparison to other second-generation antipsychotics has been challenged in recent meta-analysis (16, 35, 36). Moreover, drug combinations strategies are often used in TRP (32, 37–39) and in the “ultraresistant patients,” who do not respond or respond only partially to clozapine. It has been estimated that approximately 30% of patients who are treated with clozapine do not respond adequately (14, 40, 41). Clinical features at diagnosis can only partially predict resistance to the treatment: poorer premorbid functions, an earlier age at onset of positive symptoms, family history of schizophrenia spectrum disorder, longer duration of untreated psychosis (DUP) (26, 42–48), male gender, a history of specific substance abuse, severe negative symptoms, and presence of soft neurological signs (3, 23, 42, 47, 49–51). Functional and structural brain imaging has identified potential brain abnormalities related to treatment response or resistance, specifically at the level of the frontal cortex, basal ganglia, corpus callosum, and anterior cingulate. Nevertheless, correlations with brain abnormalities have still not been consistently replicated (52, 53). In our study, we included an exploratory meta-analysis to provide a quantitative synthesis of data from Randomized Controlled Trials (RCTs). The aim of this latter analysis was to compare the efficacy of an augmentation approach with cognitive behavioral therapy (CBT) versus treatment as usual (TAU) in patients with treatment-resistant schizophrenia. The so-called “Dodo Bird Verdict” has been suggested in many reports to indicate that different psychological therapies are of nonspecific or similar efficacy, but this view is controversial and can be contrasted by meta-analytic studies (54–59). Criteria to define evidence-based psychotherapy (EBP) have been established in youth psychotherapy (60). The comparison between EBP and the usual care has shown a more effective performance in the former but advantages in the latter (61, 62). Some researchers have used befriending (BF), an atheoretical and manualized control therapy (63), as a nonspecific relationship that works as a control group, but it has been shown that this approach could have a therapeutic impact, too (64). Nevertheless, psychological interventions have become more widely accepted over the past two decades (65–67). The majority of recent publications consider CBT the elective psychotherapy for psychosis (68, 70) and other treatments are not frequently studied. In particular, the number of articles on the psychodynamic treatment of schizophrenia was very high from 1966 to 1987, with the decline starting after 1980; however, no one was centered on treatment-resistant schizophrenia (71). Mueser et al. observed that the published studies are “only a crude index of the current therapy in schizophrenia since a small fraction of psychodynamic psychotherapy practitioners publishes their treatment cases.” In the history of psychodynamic psychiatry and psychoanalysis, psychosis has been traditionally considered impervious to treatment. However, recent literature points out to the association between environmental factors, such as childhood adversity, and the development of psychotic experiences, psychotic symptoms, and diseases (72–79). In fact, trajectory-based approaches to study clinical consequences to potentially traumatic events (PTEs) have recently emerged. In particular, prototypical trajectories have been found across independent studies, and resilience seems to determine the modal response to adversity (80). Abnormal early-life experience, such as early relationships characterized by a “lack of affectivity” during the first year of life, has been suggested to be potentially pathogenic (81). This aspect should also be evaluated as psychologically determinant in contributing to the development of a psychotic disorder. Furthermore, recent literature has also shown the important role played by the therapeutic relationships in all psychiatric settings in predicting the outcome (82–84). It has also been evidenced how therapist attitude and characteristics in the relationship can influence the outcome specifically in TRS patients (85). Therefore, in the last 20 years, there has been a growing interest in developing a psychological intervention for people who continue to experience psychotic symptoms despite adequate pharmacological treatment (14, 86–90). In early interventions on psychosis, psychotherapy is a potentially relevant part of the treatment, whereas the medication only might neither be sufficient nor efficient (44, 91–96). Medications can also determine a worse clinical condition and be detrimental, since they can have brain structural effects (97–99). Remarkably, antipsychotic treatment can result in further psychotic symptomatology at this stage, due to a dopaminergic supersensitivity effect, induced by the treatment itself (100–102). It has been observed that early psychosis patients may present treatment resistance. In particular, approximately 20% continue to have significant residual positive symptoms after 12 weeks of comprehensive treatment (103). Nevertheless, in early psychosis, a psychological or an integrated therapy with an adequate dose of medication could be effective, maximize results, prevent relapses, achieve recovery, and overcome drug resistance. Studies on the prodromal phase of psychosis have demonstrated that psychological treatments can be effective in reducing transition to psychosis (103, 104). Also, studies on psychosis onset have shown that, in selected cases, psychological interventions can be more appropriated as the first choice than medications (86, 105–107). The National Institute for Clinical Excellence (NICE) (108) and the Schizophrenia Patient Outcome Report Team (PORT) guidance included cognitive behavioral therapy (CBT) in their preferred list of treatments for schizophrenia (108, 109). Aimed at achieving a high standard of reporting, we followed the procedures indicated by the 2009 update of the Preferred Reporting Items for Systematic reviews and Meta-Analyses (PRISMA) guidelines (http://www.prisma-statement.org/) (see Figure 1) (110). Figure 1 Flow chart of review procedures. We limited our search to those records related to TRP, TRS and psychotherapy of the last 25 years, from January 1, 1993, until August 1, 2018. Such timeframe owed to methodological considerations aimed at including studies relying on homogeneous diagnostic criteria. A systematic database search was performed on MEDLINE/PubMed, Web of Science/ISI Web of Knowledge, and Scopus. The following combinations of keywords have been used: “treatment resistant psychosis OR treatment resistance psychosis AND treatment-resistant schizophrenia OR treatment resistance schizophrenia AND psychotherapy,” “antipsychotic resistant response OR antipsychotic resistance response AND psychotherapy,” “clozapine resistance AND psychotherapy OR augmentation strategies,” “partial responders antipsychotics AND psychotherapy OR augmentation psychotherapy,” “clozapine non responders AND/OR poor responder antipsychotics AND psychotherapy OR augmentation psychotherapy,” “psychosis AND antipsychotics psychotherapy augmentation,” “medical resistance AND psychosis psychotherapy,” “treatment resistant OR treatment-resistant OR treatment resistance OR treatment-resistance AND psychosis AND/OR schizophrenia AND psychotherapy AND/OR psychodynamic psychotherapy AND/OR therapeutic relationship.” RCT, meta-analyses relevant open-label trials, significant articles, including case reports, controlled and uncontrolled trials, and ongoing trials of pharmacological treatments, augmented or substituted with psychotherapeutic approaches to TRP and TRS, have been selected. No language restriction was applied, and relevant cross-references were retrieved as necessary. Studies concerning augmentation or substitution with medication have been excluded. Articles referring to TR in different pathologies from nonaffective psychosis and schizophrenia spectrum disorders have also been excluded. To overcome the problem of nonspecificity in psychotherapy, particular attention has been paid to the psychotherapy method and its details and to the control groups. Critical and systematic reviews on psychological interventions in TRP and TRS have been considered for a further review of literature. The most frequent cluster of symptoms measured by clinical scale assessments that have been included are 1) general psychopathology, 2) positive and negative symptoms, 3) cognitive symptoms, 4) affective symptoms, and 5) social functioning. The following aspects have been considered: 1) the stage of illness, such as the prodromal phase, the onset, any time after the onset and during the chronic phase; 2) the population of patients regarding diagnosis, duration of illness, age, age of onset, and duration of untreated psychosis (DUP); and 3) the type of psychotherapy, such as individual or group, duration of the treatment, frequency and time of the sessions, type of comparison or control group (if present), and blindness of the raters. About the meta-analysis portion, we performed a fixed-effect meta-analysis aimed at evaluating the efficacy of augmentation therapy with CBT on the positive symptoms of Positive and Negative Syndrome Scale (PANSS) (see Figure 2). The same analysis was replicated on the negative symptoms of PANSS (see Figure 3). A further meta-analytical random-effect evaluation was carried out in order to evaluate the effectiveness of augmentation therapy with CBT in terms of variation of the total PANSS scores (see Figure 4). The estimate uses SMD (standard mean difference pre- vs. posttreatment) as an effect size. Figure 2 Meta-analysis of PANSS positive symptoms. Figure 3 Meta-analysis of PANSS negative symptoms. Figure 4 Meta-analysis of PANSS total. The heterogeneity index of the studies and the publication bias were respectively evaluated with I2 and Funnel plots (see Figures 5, 6, and 7). Figure 5 Funnel plot of PANSS positive symptoms. Figure 6 Funnel plot of PANSS negative symptoms. Figure 7 Funnel plot of PANSS total. Included papers were those reporting efficacy outcomes about the positive and/or negative symptoms of TRS and TRP exposed to antipsychotic replacement or augmentative psychotherapy, any modality. Outcome measures could be reordered by means of varying standard rating tools or by means of the clinicians’ judgment. Two authors (DP and MP) conducted a two-step literature search, examining all titles and abstracts, accessing the full texts of potentially relevant papers. Upon data collection and extraction, the appointed authors compared their results with each other to reach a final consensus based on consensual inclusion and exclusion criteria. Any eventual discrepancy between the principal investigators, blind to each other, was solved by consultation with the senior author (AdB). Finally, the leading senior author with considerable experience on the topic (AdB) assisted in manuscript revision. Data were sought for the following characteristics: participants, interventions, comparisons, outcomes, and study design (PICOS), as well as funding sources. Specifically, the recorded variables for each article included in the review were the following: author(s), year of publication, study design, sample size, eventual follow-up or control group, outcome measures, conclusions, limitations, quality score, and quality differentiation. Potential major confounding biases in the studies were ascertained at study level focusing on the following: measurement/diagnostic bias (e.g., lack of reliable diagnostic tools to make the diagnosis of TRS or TRP), confounding bias (e.g., lack of stratification and multivariate control for specific sociodemographic, vital, or clinical features), information (especially recall) bias, unrepresentativeness or inhomogeneity of the sample size or lack of control group (where applicable), and selection by indication bias (nonrandom assignment of the exposure where applicable) (111). The present systematic review purposely encompassed a broad range of records and different types of study designs. To avoid an “apples and oranges” bias, we strived at stratifying the appraised results by discriminating between different quality levels. Specifically, observational case–control reports were appraised by means of the Newcastle–Ottawa Rating Scale (see Table 1) (118) and randomized controlled studies were appraised using the Jadad scale (see Appendix 1) (119). Table 1 Newcastle-Ottawa Scale for assessing the quality of the included studies. Any eventual bias affecting cumulative evidence (e.g., publication bias, selective reporting within studies) was assessed through the study evaluation process and accounted in the discussion of the present manuscript. The process of the literature search is shown in Figure 1. 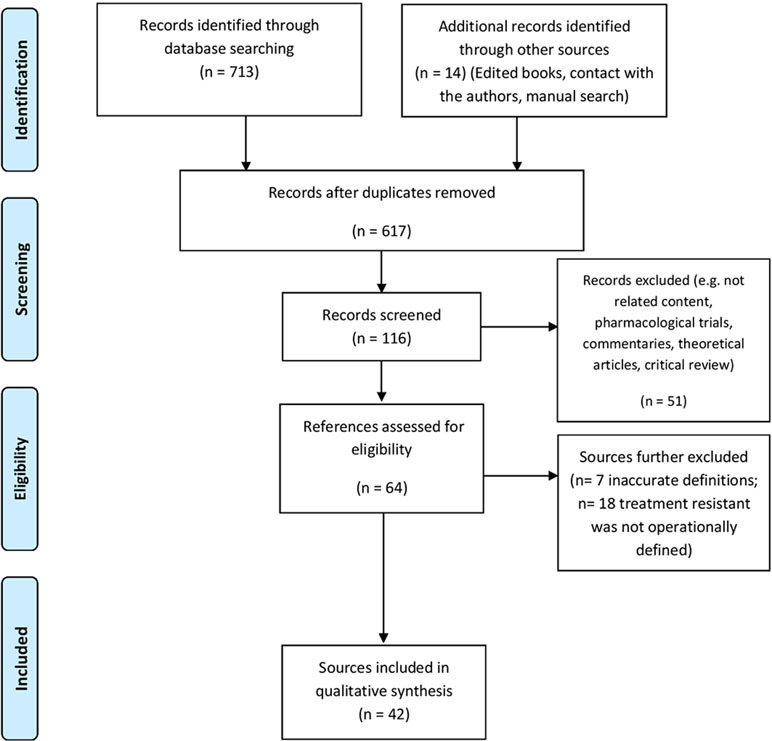 The search identified 42 references, of which 18 were RCT articles (see Table 2 for all the types of studies). Appendix 1 provides an overview of descriptive information about the 42 studies. Table 2 Study design of the included trials. Only patients who had been stable on medication for a defined period (from 8 weeks to 6 months) were included in the studies. As reported in Table 3, CBT works were found in 32 trials: 25 on individual and 7 on group CBT. Social skill training (SST) was studied in adjunction to CBT, and they were compared to supportive counseling (SC) in one trial (120). Works on family interventions (FI), psychosocial intervention (PI), psychoeducation (PE), key-person counseling (KC), cognitive remediation (CR), supportive counseling (SC), and supportive therapy (ST) were studied in comparison with CBT in 12 CBT works. No studies with these interventions alone on TRP patients have been found. In one trial, CBT was compared to SC plus PE (121). Mindfulness was used in adjunction to CBT, acceptance-based intervention (ACT), and treatment of resistant command hallucinations (TORCH) in one study (122), while it was examined alone in another work (123). One study on multimodal individual psychotherapy, including individual CBT, was found (114). Two controlled trials that compared individual CBT to treatment as usual (TAU) have been collected (117, 124). One RCT that compared CBT to enriched TAU (125) has been found. The studies regarding other interventions alone were as follows: reasoning training (RT, n = 2) (112, 126), metacognitive therapy (MCT, n = 2) (127), cognitive therapy for command hallucinations (CTCH, n = 1) (128), art group therapy (n = 1) (129), occupational therapy (OT, n = 1) (130), and psychodynamic-interpersonal therapy (PIT, n = 1) (131). Table 3 Type of psychological intervention in the retrieved studies. Ten of the 42 studies regarded group therapy (116, 123, 129, 132–138). They are shown in Table 5. The CBT studies represented the majority of articles (32 out of 42). They were generally rigorous, as 22 out of 32 were of the RCT type, including 3 follow-up studies and 2 meta-analyses, while 10 studies included six trials with a control group. Only four CBT studies had no comparison group or control group. Some CBT researchers have used befriending (BF) (122, 139, 140). An RCT study on BF in first episode psychosis has been found and reported in Appendix 2 (64). The mindfulness study used BF as a comparison group as well. The work on multimodal psychotherapy used a TAU control group. Of the remaining studies, 3 out of 9 included a control group: the brief RT was compared to the Attention Control Activity (141), OT was compared to clozapine alone (130), and the CTCH was compared to TAU (128). Moreover, a meta-analysis (138) was focused on individual and group FI studies on schizophrenia patients who were both TR and not TR patients and included CBT works in TRS patients, who were accurately described. For this reason, it has been incorporated in our work. A second phase of the same meta-analysis has been excluded, as it did not pertain to medication resistance (142). The dose of treatment was measured by the total number of sessions and was from 4 to 27, given throughout a period between 12 weeks and 24 months. In five studies, the number of sessions and the time of treatment were not specified. Therapists were generally expert, except for one case (143). In two cases, the raters were trained and experienced nurses (140, 141). One study specifically on treatment resistance in early psychosis was found (144). Another study included early psychosis in a heterogeneous group (93). Eighteen articles were trials with blind raters, while blindness could not be used in 21 works. Only one meta-analysis out of three was specifically focused on blind studies (145). 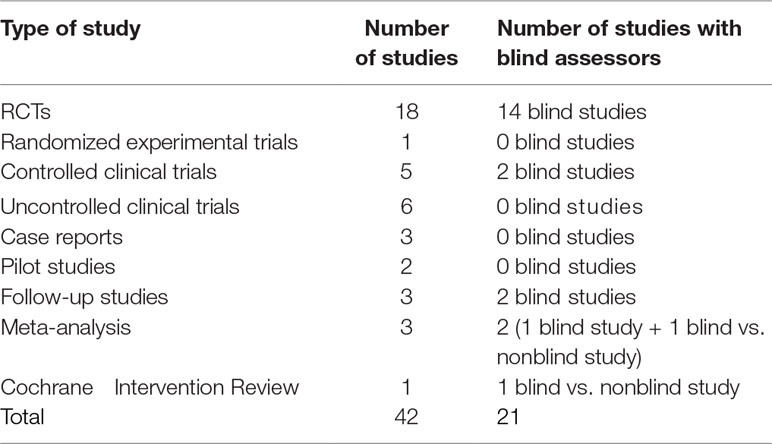 The Cochrane review compared blind studies with nonblind studies (146). The stage of illness (initial or chronic) was heterogeneous in 10 studies, where the patients who were enrolled had different ages or very diverse duration of illness. In 11 articles, the duration of illness was not specified. Twenty trials had a sample of chronic TRP patients. None of the found articles resulted in reporting the DUP. In only two studies were there patients who were not on medication. In the first, there were 5 of 40 patients in an uncontrolled naturalistic study of CBT plus FI (147), while in the second there were 3 of 12 patients on individual CBT in a RCT (148). Remarkably, no study has proposed a psychological treatment as an alternative to medication in the whole sample. No study with regard to music therapy, specifically on medication-resistant psychosis patients, has been found. However, other 18 studies, which did not focus on TR patients and were not included in this research, have been collected in Appendix 2. Assessments used to measure improvement often differed between the various trials. Hence, we pooled study results either based or not based on statistics along with the authors' conclusion to compare them. See Table 4 for details on the number of works that had statistically significant outcomes. Articles reporting no improvement are also included in Table 4. No changes after treatment have been observed in only 2 studies out of 42. Those two trials were on CBT: one on CBT integrated with FI (147) and one on group CBT (132). Table 4 Improvements observed in the different psychological interventions, which were examined in the reviewed studies. The symptomatology studied in the retrieved trials is mainly represented by the positive symptoms and, above all, the auditory hallucinations, especially in the CBT studies, while negative symptoms have been rarely evaluated. Ten studies out of 42 reported a decrease of negative symptomatology (see Table 4). Efficacy on negative symptoms has been shown in three CBT trials and in ST, CR, CTCH, and OT. 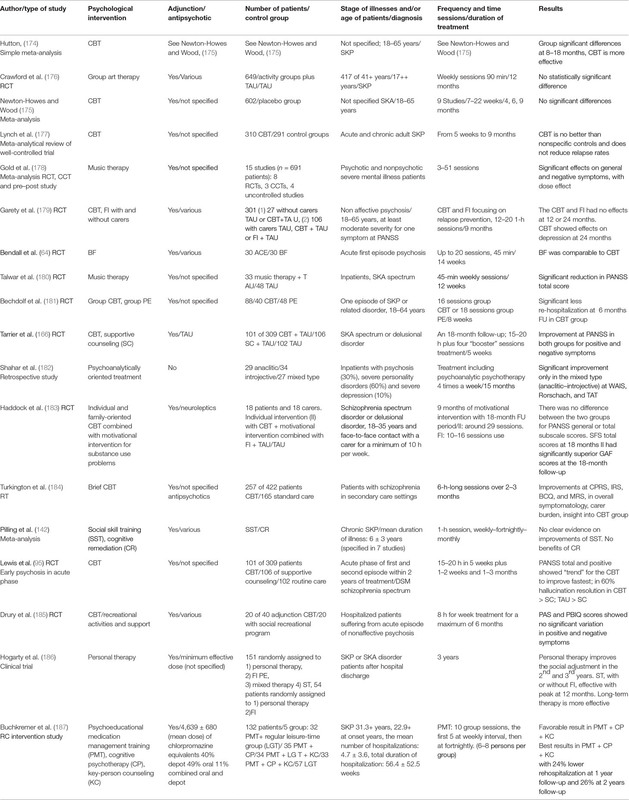 Art group therapy, MCT, and PIT trials have also reported a positive outcome on negative symptoms but without control group and not statistically evaluated (see Appendix 1 and Table 4). Affectivity has not been specifically evaluated, except for art group therapy and PIT. Clinical progress has also been observed in other areas, such as social functioning and personal care. Self-esteem and hopelessness have been evaluated, but their improvement has not been shown. Studies with chronic patients affected by treatment resistance have shown that CBT could be effective, providing positive symptom reduction, which was considered equivalent to a “medium effect size.” A trend to effective treatment has been observed as well, in case series with psychosis onset, which was resistant to medication alone: almost three-quarters of patients achieved clinically significant improvement (144). However, results of CBT efficacy compared to other treatments in TRP are not homogeneous in all studies. For instance, when compared to other treatments, similar improvements to the CBT experimental group have been observed in other comparison groups, while a significant difference has been constantly observed only from TAU (132). In particular, in the Cochrane meta-analytical review on schizophrenia including TRS, psychosocial therapies have shown no clear difference from CBT for outcomes relevant to adverse effect/events, global mental state measures, and effects on positive or negative symptoms (146). Moreover, the studies comparing CBT to another treatment, such as cognitive remediation (149), befriending (122, 140), supportive therapy (115, 120, 134), psychoeducation (113, 150), supportive counseling (121), or family intervention (138), have shown significant clinical improvement in all groups that were studied. Finally, a statistically significant major improvement in supportive therapy has also been observed (135). Two trials have shown a significant improvement in the CBT group when compared to other psychological interventions, such as befriending (139) or supportive counseling (151). Moreover, in two follow-up studies, CBT did not maintain the superiority to SC (152, 153). In particular, after 1 year from the end of treatment, CBT started to decline while SC improved, and this trend continued at 2-year-follow-up. Finally, our results show that group therapy is related to significant improvement for all psychological interventions retrieved, except for family intervention (138), where single family treatment resulted better than the group family one. In six out of seven trials, group CBT presented the same improvement as the comparison group, showing the same results that were observed in the studies on individual CBT. Fixed-effect meta-analysis: number of studies = 4; number of comparisons (k) = 4; total sample = 800 patients; SMD (standard mean difference) = 0.237 (C.I. = 0.097–0.376). These preliminary results suggest that, on average, the PANSS score for positive symptoms was reduced by 23.7% more (with a margin between 9.7% and 37.6%) in patients who performed augmentation therapy with CBT compared to patients who received the usual therapy (TAU) (see Figure 2). Moreover, this reduction is statistically significant (p = 0.001). Although the number of meta-analyzable studies is small, the heterogeneity index I2 is 0% (Figure 5). Fixed-effect meta-analysis: no. of studies = 4; number of comparisons (k) = 4; total sample = 800 patients; SMD (standard mean difference) = 0.075 (C.I. = −0.063–0.214). These preliminary results suggest that, on average, the PANSS score for negative symptoms was reduced by 7.5% more (with a margin between −6.3% and 21.4%) in patients performing augmentation therapy with CBT compared to patients receiving the usual therapy (TAU) (see Figure 3). However, this reduction is not statistically significant (p = 0.286). Furthermore, it is noteworthy that the “lower limit” of the negative confidence interval (−6.3%) indicates how, at least in a small number of events, the CBT in augmentation to the usual treatment (TAU) could potentially induce even an effect opposite to the therapeutic one. Although the number of meta-analyzable studies is small, the heterogeneity index I2 is also 0% in this case (Figure 6). Random-effect meta-analysis: no. of studies = 5; number of comparisons (k) = 5; total sample = 843 patients; SMD (standard mean difference) = 0.220 (C.I. = 0.443–0.004). These preliminary results suggest that, on average, the total score at the PANSS was reduced by 22% more (with a margin between 44.3% and −0.4%) in patients who performed augmentation therapy with CBT compared to patients who received the usual therapy (TAU) (see Figure 4). However, this result is not statistically significant (p = 0.054). Moreover, in this case, the heterogeneity index I2 is equal to 46% and, being quite high, therefore indicates a poor homogeneity of the analyzed data (Figure 7). Psychological interventions in TRP patients have shown a therapeutic effect in 40 out of 42 selected studies. In particular, results demonstrate improvement in positive symptoms for CBT, as well as for other psychological interventions, albeit with different degrees. More specifically, CBT effects in selected studies were not statistically different respectively from psychosocial intervention (146), cognitive remediation (149), befriending (122, 140), supportive therapy (115, 120, 134, 135), psychoeducation (113, 150), supportive counseling (121), and family intervention (138). CBT has been recognized as more efficient in persistent positive symptoms at follow-up. Supportive counseling (SC) was less effective than CBT at the 9-month follow-up, while it demonstrated the same efficacy as CBT at the following follow-up. Finally, the SC showed its superiority in some measures at 2 years follow-up (140, 153). It has been speculated that supportive counseling may enhance frequent and regular nonthreatening social interaction, which might have worked on self-esteem and helped patients to recuperate their social activity (16). Furthermore, metacognitive therapy has also shown significant improvements in both positive and negative symptoms compared to the baseline (but a control group was not provided) (127). Although art therapy is not strictly considered as a form psychotherapy, it has shown to lead to improvements in a short time in fields that are not easily measured by regular assessments, for example when considering interhuman relationship (129). Moreover, affectivity has not been specifically evaluated, except for art group therapy and psychodynamic interpersonal therapy (131), which were case series. In this work, clinical progress has also been observed in other areas such as social functioning, showing a marked reduction in the severe disturbances presented prior to treatment (131). Occupational therapy has been shown to give a statistically significant improvement compared to clozapine alone in the performance of the activity, in psychotic symptoms, social interaction, and personal care (130). Multimodal psychotherapy, reasoning training, and cognitive therapy for command hallucinations (CTCH) have also shown significant improvements compared to TAU (112, 114, 126, 128). The sample population targeted in the trials included different phases of the illness, showing that an integrated treatment with psychological intervention and pharmacological treatment could be helpful at any point of the disease trajectory. On the contrary, no data on the use of psychological intervention alone on TRP patients are currently available. Few methodological issues need to be considered, such as the type of intervention, characteristics of the sample, including age of patients as well as stage of the illness, and duration of the treatment. 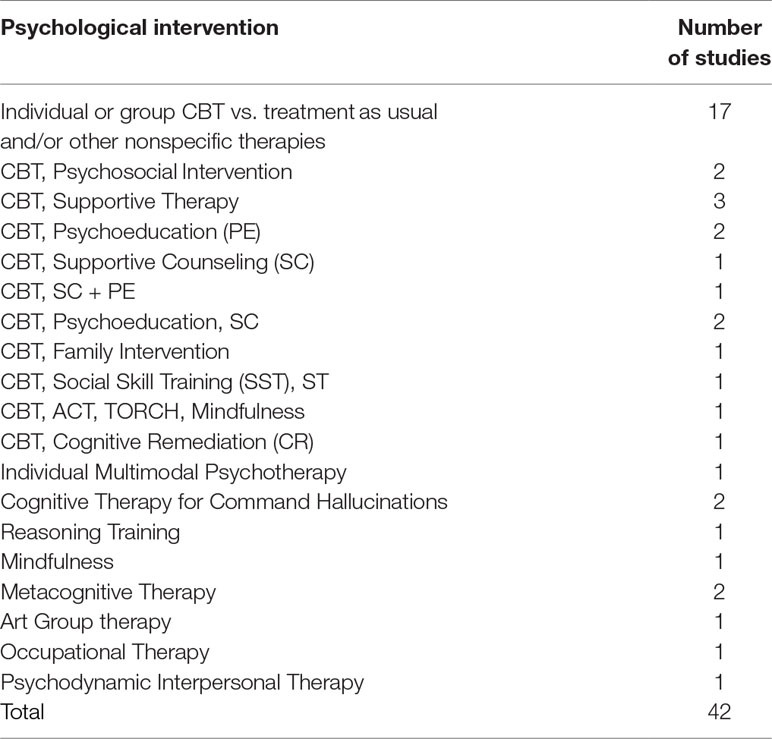 With regard to the type of intervention, it has already been observed that all psychological therapies, including befriending and supportive therapy, may have a clinically relevant impact, and statistically significant results are reported in more than half of the trials included in this review (22 out of 42, see Table 4). A controversial aspect of psychotherapeutic interventions in TRP is represented by the fact that psychological interventions, including CBT, have an effect mainly on positive symptoms while they seem to be less clearly effective on other main aspects, such as negative and cognitive symptoms. Eighteen CBT trials have shown that CBT, in adjunction to antipsychotics, could produce better outcomes on a variety of measures than medication alone, but target treatment was mainly represented by positive symptoms. In fact, negative symptoms are generally left aside and remained prevalently persistent in the majority of studies. In some trials, negative symptoms have not even been evaluated. In summary, 10 studies out of 42 reported a significant reduction of negative symptomatology: 3 on CBT, 1 on CR, 1 on MCT, 1 on CTCH, 2 on occupational therapy, 1 on art group therapy, and 1 on psychodynamic interpersonal therapy (see Table 4). These evidence are also compatible with the result of a recent meta-analysis on psychological treatments of negative symptoms in a population of psychotic patients that were not specifically resistant to treatment (154). In particular, improvement in negative symptoms has been observed after CBT intervention in patients who were at any stage of the disease. This amelioration has resulted in 59% of the studies when CBT was compared to TAU, while none of the analyzed studies suggested a benefit of CBT if compared to active controls. Moreover, another recent meta-analysis for a total of 4,068 patients who were on average moderately ill at baseline has confirmed the efficacy of CBT on positive symptomatology (155). A recent systematic review has newly reported that CR can also have beneficial effects on negative symptoms, compared to TAU and TAU plus active control in schizophrenia patients who were not treatment resistant (68). Additional researches are needed in order to test “self-disturbance” (156, 157). Consequently, it would be necessary “to tailor” psychological treatment aimed at this symptom. Since the “hyperreflexive attitude” is typical in self-disturbance and in nonaffective psychosis, CBT might not be the most suited psychological intervention on these patients. This is due to the fact that an important feature of this therapeutic approach is the encouragement of “thinking about thinking” (14, 158), which is what the patients already do repeatedly in a pathological fashion (159). It has been observed that brain dysfunctions, for example, dopaminergic supersensitivity, could be secondary to psychological events (74, 160). Furthermore, studies on brain receptor availability after psychotherapy treatments (both CBT and psychodynamic psychotherapy) have shown that a neurobiological alteration can be modifiable or reversible thanks to psychological interventions (161–164). Further steps in augmentation with psychological therapy of TRP seem to be focusing on the total symptomatology, including positive, negative, and self-disturbance. Considering that symptoms are part of unitary and complex psychopathology, acting on one aspect could be partial. On the other hand, publications on psychodynamic psychotherapy, which is focused on unconscious dimension, are poorly available; only one paper referring specifically to TRP patients has been found in this review (131). Other critical points are as follows: the characteristics of the sample, age of patients, stage of illness, and duration of the treatment. Some gaps have to be highlighted. Firstly, a marked heterogeneity of the selected sample has been observed in 10 trials, while 11 studies did not take it into account. For instance, patients at different ages or at difference stages of illness (early stage, acute or chronic phase) were located in the same group. For example, 18-year-old patients were in the same group as 40-, 50-, and 60-year-old patients: considering the different psychopathological conditions and the long-term effects of the illness (165), patients respond differently. Furthermore, it has been observed that factors associated with better outcome include a shorter duration of illness and less severe symptom at pretreatment (151, 166). In addition, in the acute phase of psychosis, CBT can produce durable and substantial clinical benefits (165). Concerning the detailed diagnosis of TR, if two different types of TRP or TRS (at the early and at the chronic stage of illness) have been identified, they should be studied separately and not in the same sample. Secondly, in the majority of studies, the duration of the treatment ranged from 4 weeks to 9 months. Only 2 studies out of 42 (114, 138) used a duration of treatment up to 21–24 months, and in one study (147), the length of intervention was 12 months. In two studies, therapy was administered in one single session (112, 126), and in four trials, duration of treatment was not even specified. A significant recovery could not be expected during a 2-month treatment period, when patients are markedly ill and/or chronic with persistent and expressed negative symptoms of schizophrenia (129). This is supported by the observations of an increased effect over time of CBT on mental state (140). For instance, in the selected articles, a longer duration of treatment can generally show better results on negative symptoms. On the other hand, recent publications on the comparison between short- and long-term psychotherapy have shown contrasting results (167, 168). However, these works were referred to nonpsychotic patients. A short-term duration is insufficient for psychotic onset patients, who need to be treated longer, considering guidelines (169). Finally, according to our results, as reported in Table 5, group therapy should also be encouraged, as it is generally well supported by evidence in improving persistent positive symptom in both CBT and other psychological interventions. Table 5 Comparison between different group psychotherapies. The results obtained from our meta-analytical extraction have confirmed that cognitive–behavioral psychotherapy is very effective particularly in the treatment of positive symptoms in TRS and/or TRP patients. This result is in line with what has already been found in other studies in the literature. The same efficacy was not found in the treatment of negative symptoms while it was only partial in achieving an improvement in the total scores of patients evaluated in the PANSS. We have also found that CBT in augmentation with the usual treatment (TAU) works well in the initial stages and then gradually loses effectiveness (170). In this regard, we can hypothesize that schizophrenia worsens over time, making treatment with CBT more difficult and therefore less effective; moreover, it could happen that, in the initial stages of treatment, there is a sort of “feeling of well-being” that does not necessarily coincide with a real clinical improvement. However, there are very few studies with a sufficiently long follow-up to clarify these hypotheses. As regards the low incisiveness of CBT on negative symptoms, we can hypothesize that patients with more pronounced negative symptoms and therefore with affective dullness and social withdrawal are less suitable for this type of psychotherapeutic approach or that these symptoms require a longer duration of treatment to be effectively affected. Moreover, given that the few studies in the literature with a longer follow-up have shown an efficacy also on the negative symptoms, we can hypothesize that the patients followed for a longer period may have benefited from therapeutic adjustments over time as well as from the CBT. The limits of these results are in some way superimposable to those already listed above about the systematic review on the same topic. In addition to what has already been said, the incompleteness and the partiality of the data at our disposal are worth noting, as, for example, not all the articles indicated the dropout rates accurately, or at what time of the treatment they occurred, or which group they belonged to (cases or controls). Psychotherapy should be considered a potential relevant therapeutic strategy in adjunction to medication in TRP patients. An intervention on psychosis that does not consider an integrative approach could miss a potential effective component of the treatment. However, few questions need to be addressed in the future in order to better understand the role of psychotherapy in TRP. Firstly, it would be appropriate to start with large-scale multicenter, controlled studies based on psychotherapeutic approaches (i.e., CBT) that were shown to be effective in smaller studies and to include patients with homogeneous domains of symptoms, duration and doses of antipsychotic treatment, as well as duration of illness. Secondly, a longer time of treatment should be conceived in such studies in order to get an adequate signal of the response. Finally, even if challenging, an important issue is to consider the inclusion of biological markers (i.e., functional imaging) before and after the introduction of the psychotherapeutic augmentation or of the substitution psychotherapy. Moreover, future studies need to adopt reliable operational outcome measures for non-CBT studies to allow quantitative extraction of information and reliable comparison of efficacy measures for psychological interventions other than cognitive therapy that are currently almost invariably not assessed in a controlled, RCT fashion. DP designed the study, searched the database, wrote the article, and created the appendices, tables, and figures. MP searched the database and participated in the editing of the manuscript. MF and VD supervised the literature procedure extraction, commented on the last draft, and contributed to the writing of the manuscript. AdB wrote and commented the manuscript, as well as supervised all work including the design of the study and the final draft. All authors have read and approved the final version of the manuscript. The Open Access has been supported by a grant of the Department of Neuroscience, Reproductive Science and Odontostomatology of the University of Naples “Federico II” to the Section of Psychiatry (AdB and FM). AdB has received research support from Janssen, Lundbeck, and Otsuka and lecture honoraria from Chiesi, Lundbeck, Roche, Sunovion, and Takeda; he has served on advisory boards for Eli Lilly, Janssen, Lundbeck, Otsuka, Roche, and Takeda. The remaining authors declare that the research was conducted in the absence of any commercial or financial relationships that could be construed as a potential conflict of interest. DP would like to thank Alessandro Mazzetta MD, Vincenzo Polese MD, Georgios D. Kotzalidis MD PhD, and Professor Paolo Girardi MD for their support in the development of the study and critical discussion. 5. Fowler D, Garety P, Kuipers E. Cognitive behaviour therapy for psychosis: theory and practice. Chichester, UK: Wiley (1995). 6. Miller A, McEvoy J, Jeste D, Marder S. Treatment of chronic schizophrenia. In: Textbook of schizophrenia. Washington DC: The American Psychiatric Publishing (2006). p. 365–81. 20. Davidson L, Stayner D, Haglund KE. Phenomenological perspectives on the social functioning of people with schizophrenia. In Mueser KT, Tarrier N (Eds. ), Handbook of Social Functioning in Schizophrenia. Needham Heights, MA, US: Allyn & Bacon (1998) p. 97–120. 25. Meltzer H, Kostacoglu A. Treatment-resistant schizophrenia. In: Comprehensive care of schizophrenia: a textbook of clinical management. London: Martin Dunitz (2001). p. 181–203. 32. Kane JM, Correll CU. Pharmacologic treatment of schizophrenia. Dialogues Clin Neurosci (2010) 12(3):345–57. 34. Lewis S, Davies L, Jones P, Barnes T, Murray R, Kerwin R, et al. Randomised controlled trials of conventional antipsychotic versus new atypical drugs, and new atypical drugs versus clozapine, in people with schizophrenia responding poorly to, or intolerant of, current drug treatment. Health Technol Assess (2006) 10(17):iii–iv, ix–xi, 1–165. 41. Zink M. Augmentation of olanzapine in treatment-resistant schizophrenia. J Psychiatry Neurosci (2005) 30(6):409–15. 45. Carbon M, Correll CU. Clinical predictors of therapeutic response to antipsychotics in schizophrenia. Dialogues Clin Neurosci (2014) 16(4):505–24. 49. Caspi A, Davidson M, Tamminga CA. Treatment-refractory schizophrenia. Dialogues Clin Neurosci (2004) 6(1):61–70. 63. Bendall S, Killackey E, Jackson H, Gleeson J. Befriending manual. Melbourne: ORYGEN Research Centre, University of Melbourne (2003). 67. Health NCCfM. Schizophrenia: core interventions in the treatment and management of schizophrenia in primary and secondary care (update). Leicester, UK: British Psychological Society (2009). 87. Ganasen K, Ipser J, Stein D. Augmentation of cognitive behavioral therapy with pharmacotherapy. Psychiatr Clin North Am (2010) 33(3):687–99. doi: 10.1016/j.psc.2010.04.008. 108. National Collaborating Centre for Mental Health (UK). Schizophrenia: core interventions in the treatment and management of schizophrenia in primary and secondary care (Update). Leicester, UK: British Psychological Society (2009). Available from http://www.ncbi.nlm.nih.gov/books/NBK11681/PubMed. 118. Wells G, Shea B, O’Connell D, Peterson J, Welch V, Losos M, et al. The Newcastle-Ottawa Scale (NOS) for assessing the quality of nonrandomised studies in meta-analyses. (2013). [Accessed 2019, April 8, on http://www.ohri.ca/programs/clinical_epidemiology/oxford.asp]. 169. Psychosis N. Schizophrenia in Adults: the NICE guideline on treatment and management, updated edition. London: NICE (2014). Copyright © 2019 Polese, Fornaro, Palermo, De Luca and de Bartolomeis. This is an open-access article distributed under the terms of the Creative Commons Attribution License (CC BY). The use, distribution or reproduction in other forums is permitted, provided the original author(s) and the copyright owner(s) are credited and that the original publication in this journal is cited, in accordance with accepted academic practice. No use, distribution or reproduction is permitted which does not comply with these terms.